Forrás: CTV News. Szerző: Jonathan Forani. It’s a typical scene for beach bums on a tropical vacation: a local artist offers some seaside flare — a braid, an anklet, or a quick henna tattoo — and you’ve got yourself a souvenir. 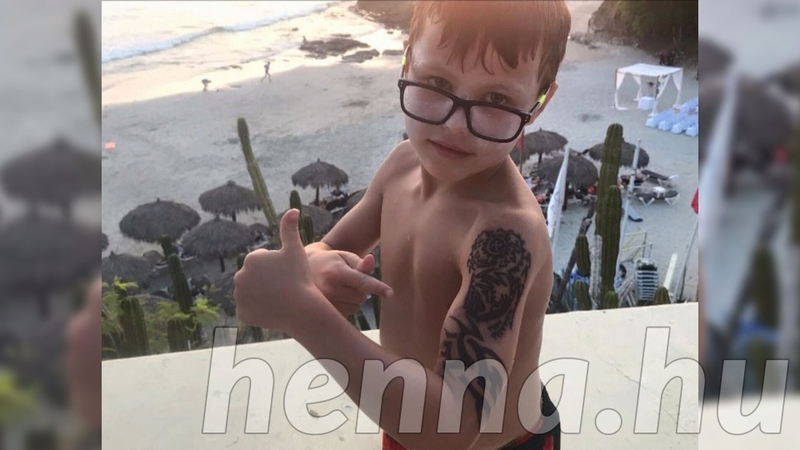 That’s what 7-year-old Cole Hunter thought he was getting in Mexico recently when a beach artist gave him an intricate black henna tattoo. But a few days later, the tattoo became painful and itchy, leaving him with a painful burn. As the black henna ink faded, a red splotchy scar remained. The inking process was a casual one, she said. They simply picked a design from a book and that was that. “We didn’t have to sign anything,” she said. When the tattoo turned red and painful, Cole was treated by a doctor at the Grand Palladium Vallarta resort, then at the Stollery Children’s Hospital burn unit in Edmonton when the family returned home. Still, the family has received no clear answer about what happened. Through her own online research, Hunter found that henna tattoo ink is sometimes mixed with a common hair dye chemical called “PPD,” or p-phenylenediamine, which blackens the henna ink. The chemical is a “restricted ingredient” on the Cosmetic Ingredient Hotlist in Canada and isn’t allowed in cosmetic products that are used on the skin, but is permitted for hair dyes. Allergic reactions to the chemical can include redness, rashes, itching, blisters, swelling and pain, according to a Government of Canada page about black henna temporary tattoos. More extreme reactions could involve hives, dizziness, fainting, stomach pains and even anaphylaxis. CTV Edmonton’s Bill Fortier called the resort, where a spokesperson said they had no record of the incident and that the beach was public, meaning anyone not associated with the resort could have been selling temporary tattoos on the beach. Cole’s mother warned others about getting tattoos while on vacation. “I would say avoid it, because there’s no way of really knowing what is in the ink. It’s not regulated,” she said. The family is expected to visit a dermatologist later this month to get an assessment of how long it may take to heal. Besides the red splotches on his arm, Cole said he is doing alright. “I can itch it and stuff, but it doesn’t hurt or anything,” he said.